A Christmas Party? A family celebration? A Christmas Day Dress? 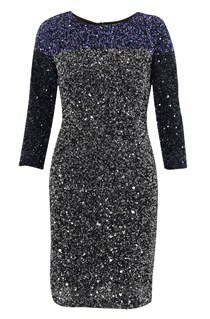 Something to shine with for New Year’s Eve..
Oh to look so glamorous! Don’t panic – help is at hand. The variety available in the shops can feel overwhelming, especially as the shops are so busy this time of year. But stay strong and follow these tips for getting a Christmas Dress – without Stress. Don’t try and squeeze in finding the perfect outfit, whilst you have a list as long as your arm of presents, stocking fillers and wrapping paper to get on the same trip. Allocate a separate trip so you can be in a different frame of mind from frazzled Christmas shopper. Give yourself at least 2 hours, then if you finish early, you can grab yourself a relaxing coffee – the rest itself will add a bit of sparkle to your face! Take a look in your wardrobe and see what you already have. Check out all those plastic covered, dry cleaned items and see if you can’t find something to wear…or if not…something to inspire your new purchase. It may be you forgot about a dress you’ve bought previously and never worn – but now you have the perfect shoes/necklace to pair it with. Or maybe your body has changed shape so you fit it better than before. Then Voila! No shopping trip needed. Maybe you already have a few good dresses in your wardrobe. Ask yourself…Do you really need another Black dress? Especially as black is a very hard colour to wear well if you’ve not got the right colouring. It can make you look seriously ill, which is not what you want before you even start the party ! 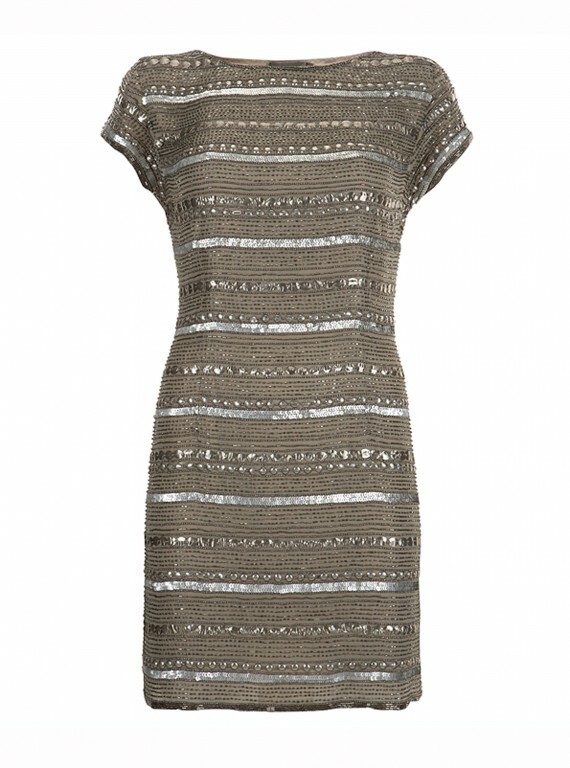 How about trying something sequinned for an on-trend update to your formal wardrobe? Remember/rediscover those clothes that you feel fantastic in. Use these to help you choose a style that you already know works for you…. (or…maybe decide you don’t need to get something new after all!) If you do need something new – work out what neckline you need. Are you more angular or rounded featured? Choose your neckline to correspond. Bingo wings? then you’ll feel safer in sleeves. Warm blooded go for short sleeves. Amazing décolletage? Go for strapless, you lucky thing!Online shopping is probably not the best way to shop for this key item. But do use the internet to research possible items to try on at the shops. Ease the shopping stress with a list of shops to target, colours and price range before you go to the shops. envisioning the shopping centre you’re going to, plan your route according to the priority shops to target and then their proximity to each other. Shop smart by being sale-savvy. Lots of places have sales on – check out FCUK or Whistles for some seasonal bargains. Also, make sure you wear clothes that are going to be simple to change in and out of. For trying on a dress , wear a casual dress with similar colour tights to what you’d wear with your posh frock. Wear comfy shoes but take your heels to try the dress on with…heels can alter the look of a dress completely. Butternut Squash/ Hourglass – Emphasise the waist with belt detail/ fitted tummy area. Ensure your bust area is well supported and there isn’t too much on show. Apple – A-line and empire tunic cuts will be flattering and disguise the tummy area. The dress should end above your knee to show off your great legs. Strawberry – Peplum dresses look fab on this shape. Go for detail below the waist rather than on/near the shoulders. Pleats, gathers in skirts will be flattering. Strapless/ fitted unfussy sleeves will work well too. Pear – Figure – hugging dresses can be surprisingly flattering if you ensure you create more drama with detail on the top half to add balance and draw they eye upwards. Go for dramatic accessories. Alternatively go for a dress that is A-line or hip-skimming. Definitely avoid bias cut dresses. Rhubarb/ Kiwi – choose strapless or short sleeved tailored dresses with well-cut waists to create curves and add femininity. Bias cut dresses will give you a great shape, creating curves and flattering where you need it. Using your list as a guide..prioritise your shops. If you want to try something different, a department store is a good option as you can try some different ranges without having to get undressed and traipse to stores located all over the place! When you’re there, don’t waste time..only select dresses you like and fit your criteria. Also select a few you would never normally choose. This will help you to see what looks good (and maybe what doesn’t!) to adjust your eye and gives you a benchmark of what you really like – you might be surprised by a wild card that works. Try them all on. When you put a dress on you know immediately if it suits you or not. Does it make you want to keep looking and maybe even showing to people outside the fitting room? If the dress doesn’t feel right, take it off pronto and move on to the next. It’s worth persevering to get it right. If you trust yourself and allocate a good few hours to get just one dress you will choose the perfect one for you. Does it look ok in the mirror or are you self-conscious? Don’t necessarily listen to the shop assistants – they aren’t often trained in knowing what looks good on different shapes and they are mainly just trying to sell. Listen to your intuition and trust your own judgement. If you feel really unsure, take your partner or a friend who can be objective with you. If you have doubts about the dress it will end up collecting dust in your wardrobe, I know I’ve seen lots of them in my job! Remember….the perfect dress for you is the one you’ll love to wear to get you in the festive mood.